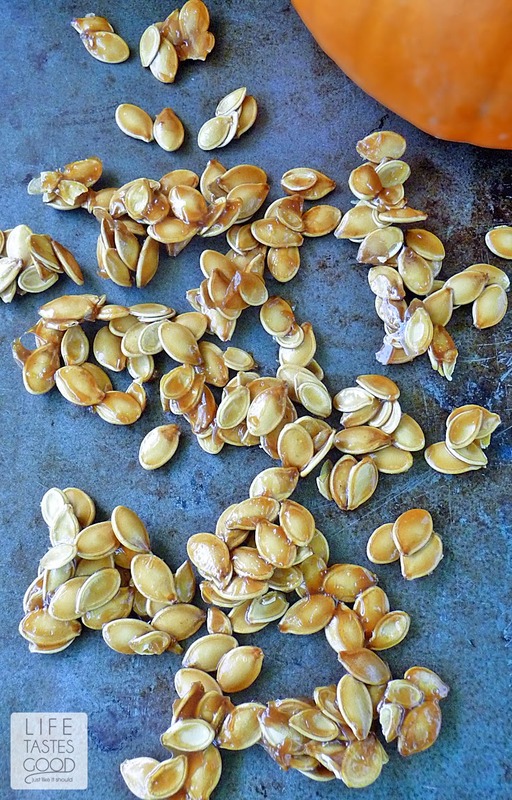 Drunken Pumpkin Seeds for #PumpkinWeek are made with Jack Daniels Whiskey, bacon drippings, brown sugar and salt. 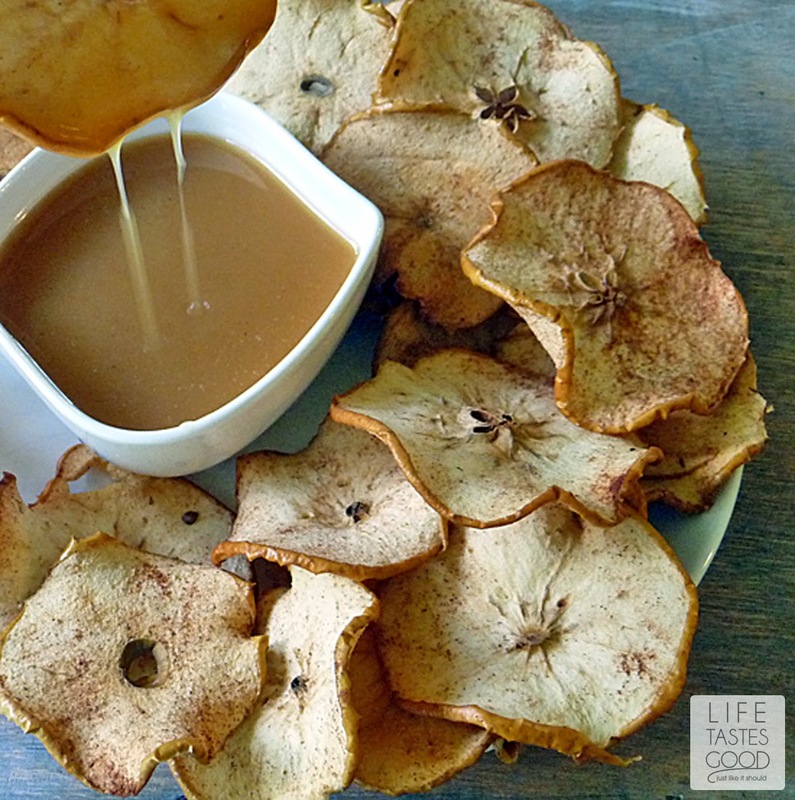 This combo makes a sweet and salty treat you'll have a hard time putting down! 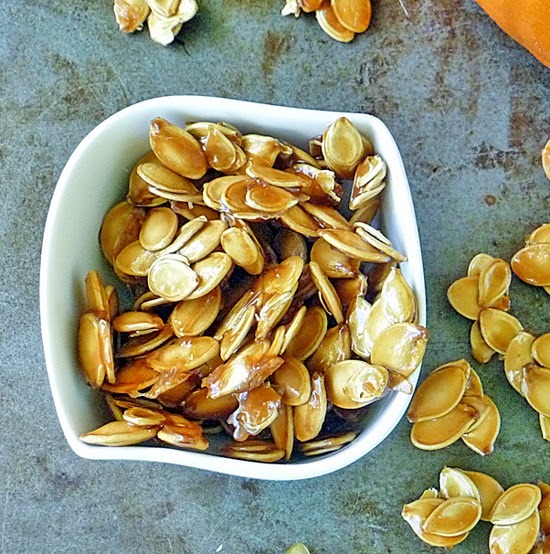 Pumpkin Seeds, or Pepitas as they are known in Spanish, are not just a tasty little chewy snack that keeps your mouth happy! Oh no, these little seeds pack a nutritional punch with loads of good-for-you stuff! 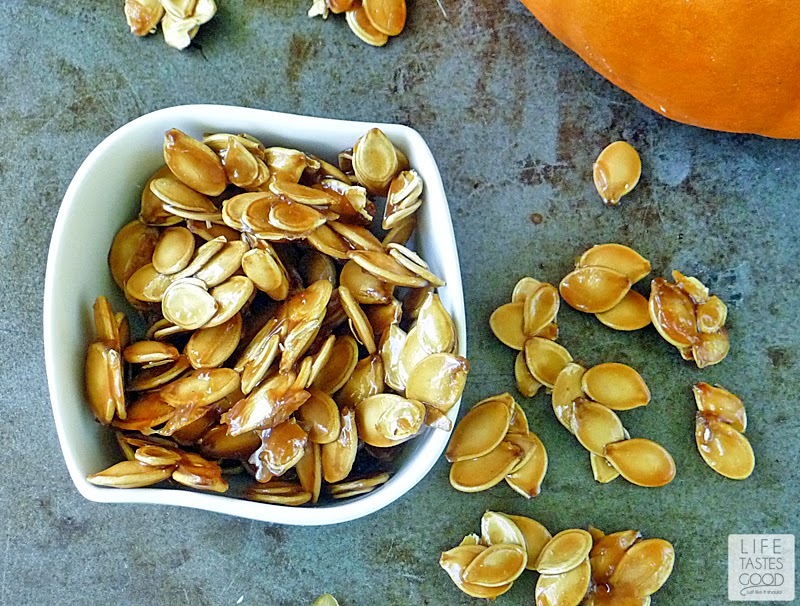 Pumpkin seeds have a wide variety of antioxidants, vitamins, minerals, and are high in protein too! These little seeds are a nutritional powerhouse, and as an added bonus, they taste great! When carving those pumpkins for Halloween, be sure to save the seeds and roast them up. You can roast them simply by tossing them with a little butter and salt or you can get more elaborate like this Drunken Pumpkin Seed recipe. The flavor possibilities are endless! Welcome to day 3 of #PumpkinWeek hosted by Terri from Love and Confections. We are celebrating our love of the season with a whole week of pumpkin goodies, leading up to National Pumpkin Day. 17 Food Bloggers have come together to share over 65 recipes with you. In addition to homemade pumpkin puree, pie, and cookies, we are also sharing savory pumpkin dishes like hummus, chili and pumpkin corn chowder. Come back every day for #PumpkinWeek recipes. You can also find these great recipes and more on Love and Confections' #PumpkinWeek Pinterest Board! These seeds also make a unique gift. Just package them up in a nice jar and tie a ribbon around it. It will look nice and everyone will enjoy having a homemade snack. It's a great idea to keep some jars on hand for unexpected guests around the holidays or to give to all of your Thanksgiving dinner guests to take home and enjoy. Preheat oven to 275°F and line a baking sheet with parchment paper. In a saucepan over mid-high heat, combine 1 cup pumpkin seeds, 1/4 cup Jack Daniels, 2 tablespoons bacon drippings, 1 tablespoon brown sugar, and salt to taste. Bring this mixture to a boil and reduce heat to mid low. Simmer for 15-20 minutes until the sauce is reduced to a glaze. It will be quite sticky. Spread the glazed seeds onto a baking sheet. Try to get them in a single layer as much as possible, keeping in mind the glaze is going to stick them together, so don't drive yourself crazy over it . Season with a little more salt as needed and roast the seeds in the oven for an hour. Remove and allow to cool. Enjoy! Oh, these sound amazing! I've only made them with salt...and I need to up my game! There are so many options!! Thanks, Liz! I know, right?! How can you go wrong?! Thanks, Wendy! Oh, my word! I have some duck fat that has been looking for the perfect recipe. I found it! Thank you, thank you. I'll link to this when I post mine. Thanks for the inspiration. Oh Marion, you've done it yet again! I think you are totally amazing! Whiskey, caramel crunch on a pumpkin seed? I'M SOLD! 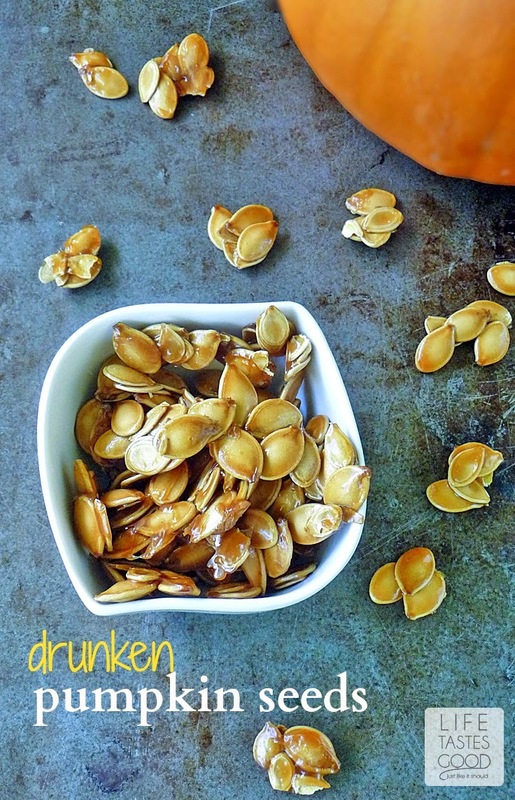 Drunken Pumpkin Seeds are pure genius! Wow. Wow, Marion. 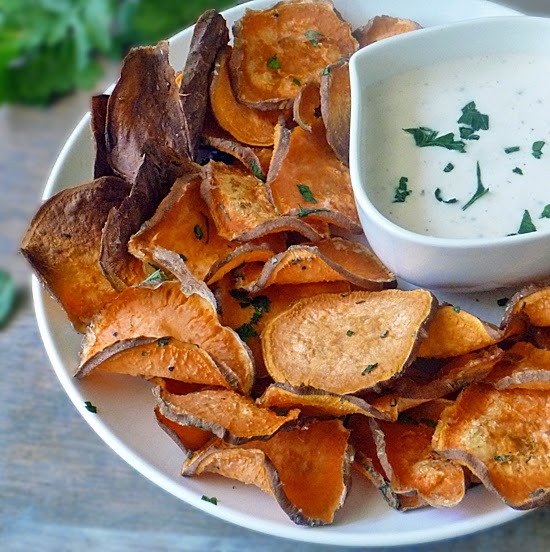 I do believe I know a few men who might fall in love with you..I mean your pumpkin seeds :) These look amazing! hahaha too funny, Valerie! These have definitely been a big hit! Thanks!! I love when people use bacon fat in their recipes! Totally up my alley! Great recipe! Me too, Sheena!! I always keep some on hand and use it frequently! thanks for stopping by! OMGoodness, drunken pumpkin seeds! I have to make these for our next happy hour. What a great recipe! Thanks, Mary Ellen! I hope you enjoy them! I believe that my teenage son ONLY still carves a pumpkin each year just so he can have pumpkin seeds, lol! ;) He likes them just simply roasted with olive oil and salt, but I like this version MUCH better myself! That's a great reason to carve a pumpkin! Thanks for stopping by, Carrie! I absolutely love pumpkin seeds. I have never tried them with anything but a little salt so this will be a welcome change! I hope you enjoy them, Kristin! Thanks! You had me at Drunken! Too funny, Michele! Thanks for stopping by! These sound amazing! Do you think the alcohol burns off? It absolutely burns off, Jen! You can't even taste the whiskey, but it does a nice earthy caramel flavor. Thanks! Whiskey and bacon drippings and brown sugar... wow. these are some decadent pumpkin seeds. Love it! Bacon fat! Yum! I love saving the seeds and making tasty snacks out of them, and this looks like a great way to do it.